There are times when employers are faced with workers who do not perform as expected. Written documentation of the undesired behavior is required either to correct the action, or to compile a history of the employee’s performance in their personnel file for use in further action, up to and including termination. By standardizing the written documentation with an Employee Warning Letter Template, employers can save time and also avoid false accusations of discrimination. 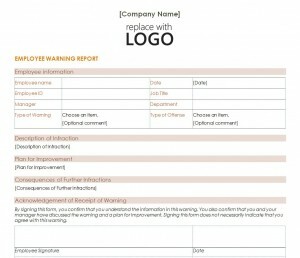 Each company has it’s own set of policies and procedures which makes a customizable and easy to use Employee Warning Letter template a valuable tool. A template is available and ready to download free from this page. Be clear and objective in the description of the expected behavior and how the employee failed to perform satisfactorily. This is helpful if the Written Warning Letter is being read by a third party unfamiliar with your company’s policies. Downloading the free, easy to use, Employee Warning Letter Template will add standardization, efficiency, and objectivity to the disciplinary process. This will help keep the company running smoothly and inform the employee on what needs to be improved upon immediately.